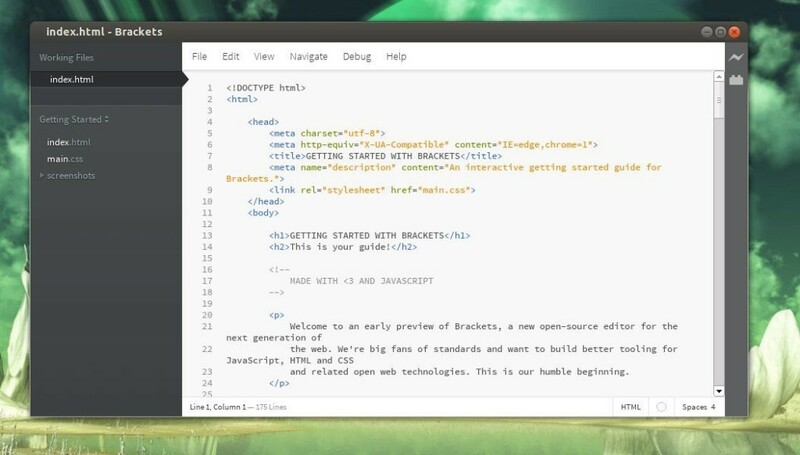 The brackets text editor has reached the 1.10 release recently. Here’s how to install it in all current Ubuntu releases including Ubuntu 14.04, Ubuntu 16.04, Ubuntu 17.04, Ubuntu 17.10, and their derivatives. Supports more than 40 different file encodings. You can Open/Save files with different encodings. CSS code hints support @rule and pseudo selector/element code hints. Provides CSS code hints in style attribute value in html. HTML menus are replaced with native menus in Linux. Although there are official .deb binaries available in the release page, an Ubuntu PPA repository is a good choice to keep the software up-to-date easily via Software Updater utility. 1. Open terminal via Ctrl+Alt+T and run command to add the brackets ppa maintained by webupd8 team. To remove the PPA repository, simply launch Software & Updates utility and navigate to Other Software tab. On the line to install Brackets Code Editor command to install is missing. Is only sudo apt-get brackets. “brackets_1.10.0libgcrypt11-17483+1~webupd8~0_amd64.deb” package for 64-bit system. This is a error i am getting while installing brackets via deb. let me know what is the mistake?